How could a professor of engineering from Duke University and a famous cartoonist independently predict the outcome of the 2016 US presidential election correctly, without knowledge of political strategy, access to pundits, supercomputers or funding – while all the so-called experts got it wrong? Dr. Adrian Bejan, a renowned expert on thermodynamics and Scott Adams, the cartoonist of Dilbert fame both used basic principles to make their predictions. The surprising answer and the topic of this post, is that the principles arise from the same source and inevitably lead to the same conclusion. In 1996, Dr. Bejan first articulated a new law of physics – the Constructal Law. It is simply stated: “For a finite-size system to persist in time (to live), it must evolve in such a way that it provides easier access to the imposed currents that flow through it.” This may sound obscure, but it has profound influence on our understanding of nature and the evolution of the universe as a life form itself. Scott Adams is a master at understanding how people use and value information, the field called “infonomics.” His profound understanding of Donald Trump’s use of language led him to predict Trump’s win even before he was nominated. How are these two wildly different fields of cartooning and thermodynamics related? At this point, I would like to introduce my field of infonomics. Infonomics – The study of how people use and value information. This includes the personal use of information devices, the social use of information and how people design and use information networks and media. Infonomics also includes the study of the mental processes, cognition and intelligence, which underly our connection to the external information world. I will argue that at their roots, both thermodynamics and infonomics are related. In this brief article, I will begin to paint a picture of how all things that humans experience, know and indeed, how we evolve, are linked at their deepest levels. While there are millions of theories about how things work, the classical laws of nature are few and simply stated. The laws of nature include thermodynamics, electromagnetism, motion and gravity. Most were discovered and stated more than a hundred years ago – until the new discovery in 1996 of the Constructal Law by Professor Bejan. The Constructal Law can be used to build theories about how things work. One such theory is what I call the unified theory of information. It is the basis of the study of infonomics. Information is not etherial, not something “other” than ordinary matter and energy. For information to flow, stored information is transmitted from a source to a receiver via an energy exchange. Of course, energy exchanges take place by the gazillions every instant of time throughout the universe. But not all energy exchanges are information. Information does not exist in the absence of a receiver. In order for information to exist, received energy (information) must be stored in an organized manner for use by a sentient being – including but not limited to humans and biology. The receiver can then incorporate received information (or not) as knowledge, to enable action in the environment. Acting internally is what we modestly call thinking. Now let’s return to the Constructal Law and “flowing systems” as described by Bejan. According to the Constructal Law anything that flows, say a river, will morph, or adapt, its channel to maximize the efficiency of its flow. Bejan has demonstrated that the shape of a tree and the the shape of a river delta all evolved to increase access for the flows that pass through them, as is the branching structure of your lungs and circulatory system – and the neural networks in our brain. They are all determined by the same law of nature – the Constructal Law. That the flows of information in human societies and networks follow the Constructal Law is easy to demonstrate – the Internet and cell phones are two obvious examples where the technical channels are morphing to facilitate the flows of information through them. In addition, Bejan describes how flows follow an S-curve evolution. A river for example, starts with a number of short, small tributaries which merge into a large single flow of the river. At the end, when the slope decreases, the river spreads out across the landscape to form a delta. This evolutionary S-curve is common to all flow processes throughout nature, including human societies. 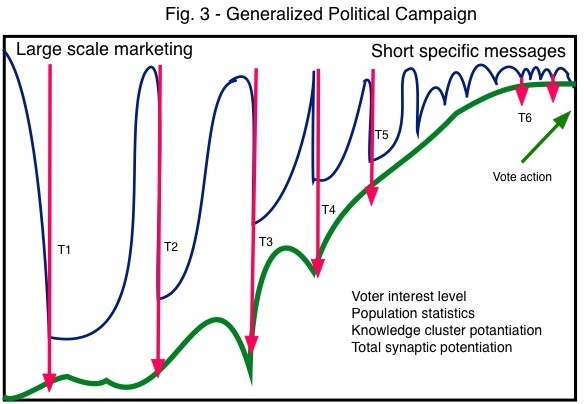 Bejan describes the interest in political subjects, as an S-curve of interest. While he describes this process in terms of thermodynamics and documents the phenomena mathematically, there are many examples of the same flow process in sociology, neurophysiology, politics and infonomics. This is where we begin to see the connection between these humanistic subjects and fundamental physics. As Scott Adams so charmingly puts it, humans are “meat robots” programmed to respond to whatever is in front of them at the moment. True, but let’s go beyond that simple statement to understand the process by which both Adams and Bejan correctly predicted the election results. When the subject we are learning is new, we pay more attention and absorb it rapidly. However, at some point, our interest levels off and new information simply fills in details. Over time, we may forget some or all of what we learned. Unless it has an emotional hook, we become less sensitive to further stimulation. For example, at the beginning of the Obama administration, most everyone in the United States knew that health insurance needed fixing. The topic was debated endlessly until the Affordable Care act was passed. After that most people thought that for better or worse, the problem was solved and moved on to new problems like gender identity. Republicans, by continuing to make the repeal of Obamacare their main issue, were actually beating a dead horse, as witnessed by the abject lack of interest in any of the 16 traditional Republican candidates. Trump ignored the health care stories and gave people big, new and fascinating things to think about – like building a WALL between two countries. “A big beautiful wall.” And Mexico would pay for it. Obamacare was so 15 minutes ago. Trump simply pushed past the traditional political dialog and captured the attention of meat robots of all stripes. Like him or hate him, no one could ignore what he was talking about. In short we pay more attention to inputs that are novel, emotional or confrontational. Trump provided an endless stream of novel and attention grabbing news on a daily basis, keeping everyone focused on him. When confronted with a laundry list of offensive things he had said about women, rather than answering the question directly Trump simply said “only Rosie O’Donnell.” Over the next week, millions of person-hours were consumed thinking and talking about this completely irrelevant subject. Everyone, on all sides of the political spectrum were hanging on what his next controversial statement might be. No one could be bothered to talk about substantive issues of political policy. 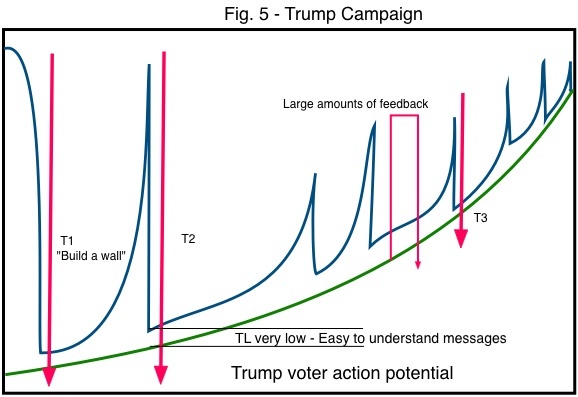 Trump’s Constructal Law S-curve of attention shot up like a rocket. All the other politicians, peddling their old news and political correctness were left in the dust.Trump’s campaign strategy was astoundingly effective, tapping into the emotional dissatisfaction of many. How did the predictions work? So we return to the question – how did two experts in unrelated fields come to the same correct conclusion while all of the politics experts, with access to every scrap of information, big budgets and supercomputers, completely fail to predict the outcome? The answer is that both Bejan and Adams based their predictions on very simple basic physics principles. Bejan approached it from the perspective of information flows within a population. Adams analyzed the communication stimuli being applied to those flows. The flows of information passing through us constantly morph our bodies and our brains to maximize the efficiency of those flows. We attempt to direct the information flows to maximize the efficiency and effectiveness of our own existence. They define who we are and what we do on a daily basis. Like most consumer advertising, in a political campaign the objective of the information flows is to influence us to take an action in the physical world, like voting or buying a car. Both of these actions require a great deal of attention, interest, time and access to other energetic flows like money, physical resources like cars, phones, television and commerce. We also have to interact with other people, like friends family and sales people, who are themselves trying to influence our behavior for their own purposes. In this dynamic environment, information is not a static commodity. It demands to be constantly changed and refreshed or it will gradually lose currency against the incessant flow of new information demanding our attention. The 2016 U.S. presidential election was just such an event on a national scale. One candidate represented nothing new or more interesting than technocratic competence. The other, with no experience whatsoever, was able to convince voters in key states that the ability to capture attention was a sufficient qualification for taking control of the United States government. The 2016 election will go down in history as unique. Few of the professional pundits predicted the outcome. 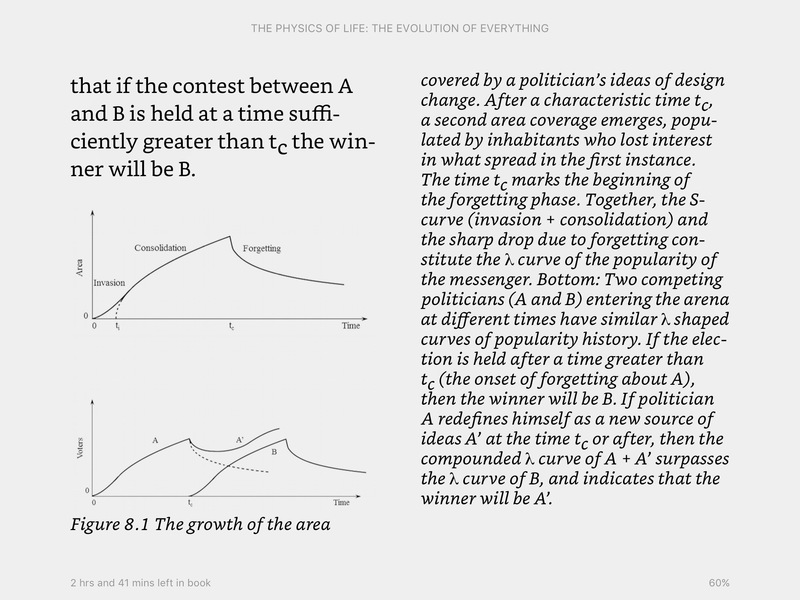 However, between Adrian Bejan and Scott Adams, a door has opened through which the to begin the study and understanding of the communication flows and new S-curves that will shape the future of the entire world. For those who want to go further, what follows is a discussion of an infodynamic model allowing analysis of communication processes across the spectrum of social, technical and biological applications. The model is based loosely on the concept of charge separation, the Coulomb effect, which underlies all neuronal, electronic, biological and most technical communication methods. Just as thermodynamics is the study of the physical flows and properties of heat without regard to the ultimate use to which it is put, infodynamics is what I call the study of the physical nature of information flows. It underlies and overlaps with the study of infonomics, which is about the application of those physical properties. First, consider the most basic form of human communication, having a conversation. In this diagram, the information “state” (receptiveness) of the receiver is indicated by the green line. In a single conversation, a speaker talks (blue curve), and more or less of the information is received by the listener. One can view the model as the transmitter and receiver having opposite charges. At some level of potential energy between the two, the dielectric resistance gap is partially overcome and information flows from transmitter receiver. As a dissipative system, there will always be some transmission loss in line with the second law of thermodynamics. 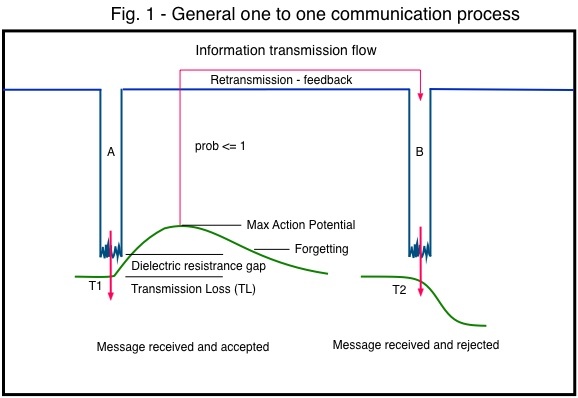 The actual composition of the transmission resistance is a complicated function of technical issues e.g. background noise, hearing loss, language barriers, receptivity to the message, distractions, etc. For example, any broadcast advertising will only be seen by a fraction of the potential viewing audience and will only find a smaller percentage receptive. As Bejan has pointed out, flows of information in any flow system including political, leads to rising interest and attention, followed by losing interest, as discussed previously in this article. Information is received and integrated with existing knowledge of the listener. His/her action potential (interest) may rise (or fall) following the conversation. As the new information is integrated with other information it may reinforce their existing interest (confirmation bias). This higher level of action potential may lead them to talk to another person about the subject and/or do something about it. In the T2 example, information provided to a receiver by B diminishes the interest of the listener. All nervous systems, including our human brains, include neurons which transmit information by way of synapses, where a sending neuron connects to a receiving neuron. Neural networks are collections of interconnected neurons. The extreme number of possible interconnections (10,000 or more per neuron), points toward highly complex interactions. Since every junction in a neural network is a synapse with an action potential, one can look at a “thought” or a “concept” or a piece of “knowledge,” as the sum of all the associated action potentials. The precise physical value of the sum for humans is unimportant and probably unknowable. However, we can assign relative values to knowledge “clusters” as described below for the purpose of determining the scope and associative potential of a knowledge actor, also described below. Applying the individual model to a larger statistical population of transmitters and receivers, this chart shows the effect of multiple communications on any defined group of receivers. Consider T1, a communication event, e.g. sports event, political speech, entertainment event, etc. 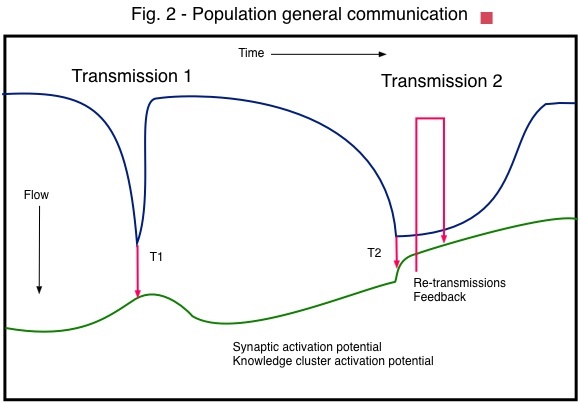 The area above the transmission curve before the event represents the total communication energy transmitted leading up to the event. Advertising, news, word of mouth, all contribute. This in itself builds interest, raising the population interest level and decreases the “resistance gap” increasing the likelihood of successful future communication. If all goes well, the communication strategy will lead to maximum receiver interest at the moment of the event. Television shows are in reality Trojan horse strategies, using the program to engage the audience and create a very small transmission resistance. Then, commercials (information viruses) pour through that short gap, hoping to grab attention before the viewers can put up their resistance shields. It is of course an arms race, with alert viewers able to hit the mute button in a fraction of a second. One might argue, however, that the audience the broadcasters are seeking to influence are the mentally lazy and uncritical who will fall pray to the standard discursive tricks of the advertising trade. Commercials are viruses in the sense that they are not complete thoughts or stories. They are designed to infect the brain of the viewer, change the programming of their neural networks and cause them to take action like buying a car, which is the feedback that produces more viruses. If the event is not discussed much, or does not attract subsequent media interest after T1, receiver interest peaks and drops off quickly. In the lead up to T2, there is considerable previous communication, which builds interest and anticipation in the population. Maybe the Super Bowl or World Cup. After the event, there is much media discussion, people talk to each other (feedback) and population interest may continue rising. Now let’s look at a generalized political campaign – the objective is to get people to come out and vote – a physical act. All political movements begin with some “Big Ideas” which are put forward and engender prolonged discussion and attract interest. 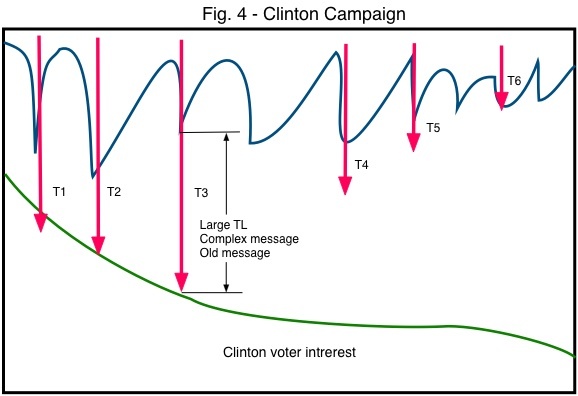 Over the course of a campaign, a series of increasingly specific pronouncements are designed to increase and consolidate voter interest in order to ensure a vote for the candidate or party. As the election comes near, the fast and narrow Bejan S-flows flatten out into shorter wider communications – grand policy pronouncements give way to sound bites and get out the vote messages aimed at highly targeted groups and individuals. The total communication energy may be the same (the integral of the area above the transmission curve), but it is distributed in ever more diverse and smaller channels. At least that is how it is supposed to work in politics as usual. In 2016, Hillary Clinton ran a classic politics as usual campaign. She had all the machinery in place and knew what to do on every day leading up to the election. However, her issues platform was inherited from Obama and she brought no new or attention grabbing ideas to the arena. Voters were numb to arguments about domestic policies and group identities, not to mention foreign policy which is beyond the comprehension of even acknowledged experts. Therefore, her messages had long ago reached the descending part of the Bejan interest curve. Here TLs were large and increased, as voters became tired of the same old messages and scandals. By the time of the election, her well organized “ground game” to get out the vote wasn’t even connecting with the intended voters. Her traditional base of blue collar workers and minorities simply stayed home despite massive efforts to move them. This brings us to the very non-traditional Trump campaign. He did not follow the politically correct path of well publicized policy pronouncements which would supposedly gain the interest of voters. Instead, he embarked on a campaign of surprise attacks – seemingly random and irrelevant comments. With no prior buildup, he would drop verbal bombs which were impossible for anyone to ignore, especially for the press. Whether you agreed with him or not, they were always easy to understand, which guaranteed low TL. All of them engendered massive subsequent discussion and feedback. Everyone was talking to everyone else about Trump. As the election approached, the media lamented that Trump had no ground game at all, so how could he possibly win. Trump continued with his rallies, where he tested and perfected his verbal bombs. People voted for Trump because they were energized by his personality to do so, not because some neighborhood political flunky knocked on their door and offered them campaign literature. With consummate ease, Trump threw the orderly and politically correct process of the election into chaos. As the analysts sought concrete information in search of the beliefs and policies of Trump, he led them on a merry chase and dumped all of their vaunted predictive capability into the trash. It will be very interesting to see how his strategy plays out in the new game of governance. Even before his inauguration he is ignoring rules and remaking the etiquette of politics. We live in interesting time, the start of an entirely new S-curve. A time that will be marked by the remaking of politics around communication flows and processes. See the Physics of Life review posting on this blog. I view information as a carrier not a source in the same way that electricity is a carrier of energy not a source. So what would the source be? Knowledge? I’ve ordered the book from the library. Looking forward to reading it. Enjoy the book and please come back here to comment. You are exactly right that information is a carrier, an energy transfer. A source can be anything – an observation that the sky is blue, a book, a conversation etc. We take in information and “digest” it into knowledge. We express our knowledge by thinking (internal action), or doing something in the environment – going to the library, a conversation, making something, buying a car or voting. I’ve just started publishing on this blog – there is a lot more to come which will hopefully fill in the picture. Thanks for your interest. The media next day was unanimous that Clinton had won the debate. But I thought to myself: I can’t remember a single thing that Clinton said. But “Make America Great Again” “Bring jobs back” were still ringing loud. margin and managed to win narrowly in a few critical states. Only a state level analysis can do that. If the election was decided by the popular vote, you would be right. But it isn’t. Trump himself said that he campaigned to win the electoral vote and if the criteria was winning the popular vote, he would have campaigned in different states. End of analysis. You may not like the outcome, but now it is important to understand how Trump works in order to understand what is coming down the pike.